New eBook about PassivHaus has been launched online, based on the findings of a twelve month research project involving practitioners, academic researchers and a team of students from the MArch (stage 5) and BA Architecture (stage 3) programmes. The UK building industry, compared to their Austrian or German counterparts, has limited experience with delivering the PassivHaus standard, but pioneering efforts over the past eight years to implement buildings of this standard in the UK has provided the impetus for cross-industry collaboration, technical innovation and evidence-based design. 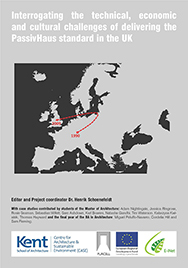 The eBook, entitled ‘Interrogating the technical, economic and cultural challenges of delivering the PassivHaus standard in the UK’, is based on a collaborative research project coordinated by Dr. Henrik Schoenefeldt at the Centre for Architecture and Sustainable Environment at the University of Kent between May 2013 and June 2014. This project investigated how architectural practice and the building industry are adapting in order to successfully deliver Passivhaus standard buildings in the UK. Through detailed case studies the project explored the learning process underlying the delivery of fourteen buildings, certified between 2009 and 2013. Largely founded on the study of the original project correspondence and semi-structured interviews with clients, architects, town planners, contractors and manufacturers, these case studies have illuminated the more immediate technical as well as the broader cultural challenges. The peer-reviewers of this book stressed that the findings included in the book are valuable to students, practitioners and academic researchers in the field of low-energy design and will be further discussed at the PassivHaus Project Conference on the 27th June 2014. The eBook is available for free online here.